TORONTO - For the third time in as many seasons, the Jokers Hockey Club has revealed a new alternate jersey, and some say it's bound to turn heads... and stomachs. In a jarring departure from the team's long-held Teutonic colour scheme, the new sweaters feature the team's name rendered in dark brown twill and arched across the front of a bright, safety-orange sweater. According to one sports apparel professionals, the new shirts aren't much to look at. 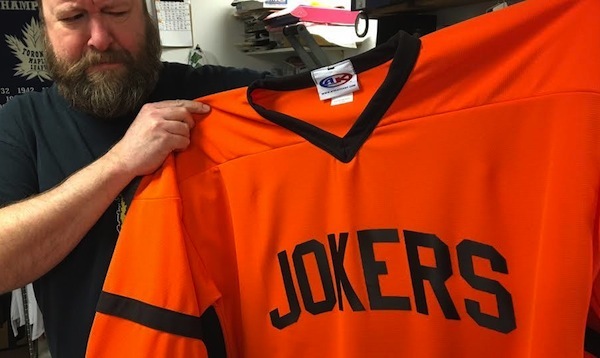 "It's a nightmare, basically," says Tommy Gough, one of the design and production gurus at Big Stick Custom Hockey Jerseys - the firm that handled the latest Jokers order. "And I don't mean like the Nightmares, who had those eggplant-coloured sweaters a few years back, although those were pretty hideous, too." Gough, who plays for the Parkdale Hockey Lads (a rival UUHA squad of the Jokers) says he's also perplexed by the Jokers choice of colours for the new team set of sweaters, given there are already three other squads in the eight-team league with orange jerseys. "The Humiliation have orange jerseys, the Rockets have a black and orange jersey, and the Porcupines even have brown and orange in their dark jerseys," says Gough, shaking his head. "So not only is this sweater bound to confuse things, but if you look at the collective successes those three teams have had... Let's just say you'll be looking for awhile." Though originally intended to be unveiled during the President's Cup-wining team's inevitable appearance in this year's Championship Final, the Jokers (who will instead face the Lads in the Consolation Final next weekend) plan to reveal the new sweaters at the Mike Takacs Roast taking place at the Comedy Bar on Friday, April 14 (see poster below). As part of a special tie-in promotion that evening, anyone wearing orange will not be required to tip their servers.